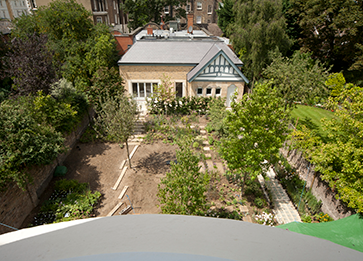 The existing basement of a listed Georgian house was extended beneath the garden to connect to a new build basement dug below an existing garden building at the edge of the property. The new subterranean room accommodates a swimming pool and is covered with a 300 M² turf roof. Triton’s TT Vapour Membrane was used as the primary method of waterproofing the new ground slab (basement roof) and this was covered with Platon Double Drain membrane to form a protective layer for the primary waterproofing and a drainage layer for the turf roof construction. TT Vapour Membrane is a liquid applied coating (NBS Clause No J30) which, once cured, provides a waterproof and ground gas proof barrier. The new slab was laid to falls and two coats of TT Vapour Membrane were applied at a rate of 1 Litre per M² (each coat) to the slab, and returned to the upstand wall and in to pre-formed drainage discharge outlets within the upstands, which direct any excess water to a land drain below slab level. Platon Double Drain membrane (NBS Clause J40) comprises a studded HDPE membrane with a Geotextile fleece layer which is heat welded to it at manufacture. Laid with the fleece layer uppermost, this filters any fines, clay or soil from entering the intended drainage/water collection point.